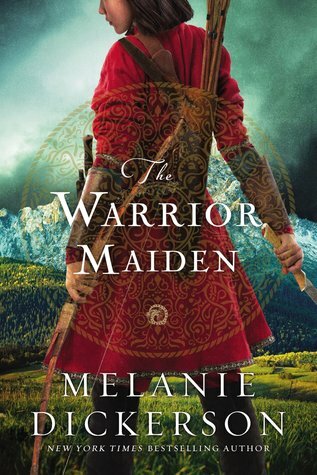 The Warrior Maiden by Melanie Dickerson is a retelling of the story of Mulan, a girl who disguised herself as a man to fight in the place of her father. Mulan is an Asian girl who grew up in a Lithuanian town. When her father dies, she decides to take his place as a soldier so that the army does not confiscate her mother’s house. She changes her name to Mikolai, and joins in the fight against the Teutonic Knights. Wolfgang is the son of the Duke of Hagenheim, and greatly desires to be a knight, but knows he will never reach that goal in Hagenheim. He joins the fight against the Teutonic Knights, expecting his brother Steffan will fight alongside him, but then learns his brother has joined the Teutonics and will be fighting against him. This is an action-packed story with a traveling war setting. I thought it was an interesting shift from the rest of the Hagenheim series, which was mostly set in castles and towns. This series has tended to follow fairly similar storylines, but The Warrior Maiden had an interesting and fast-paced plot with some more unusual elements and a good sense of time and place. Mulan was a very interesting character. Some YA books make it seem like a girl can’t be strong and feminine, but Melanie Dickerson does a very good job showing that Mulan is strong, and she is a woman. When I saw the cover, I thought this book might be set in Asia, but other than the main character’s race, the Asian influences in this book are minimal. Mulan is of Mongolian descent and was adopted by Lithuanian characters, and the story is set in Europe. Wolfgang, on the other hand, wasn’t much different from the male leads in the rest of the series. He realized Mulan wasn’t who he thought she was, came to terms with it, saved her life, and fell in love with her. He could have been with any of the other male characters from the Hagenheim series and I don’t think the book would have been much different. Other than some struggles with his brother that started to develop him uniquely as a character, I didn’t feel like there was much to Wolfgang. Overall, this was an enjoyable fairy tale retelling, with Mulan as a wonderful and interesting main character and a fast-paced plot. The dialogue was somewhat stilted at times, and once or twice I was confused as to who said what, and Wolfgang was a rather bland character. However, getting to know Mulan as a character and enjoying the unique setting more than make up for those negatives. The Warrior Maiden is now my favorite book in the Hagenheim series. If you like any of Melanie Dickerson’s other books, Ella Enchanted by Gail Carson Levine, Cinder by Marissa Meyer, or the Alanna series by Tamora Pierce, you will enjoy The Warrior Maiden, which releases February 5, 2019. Have you read any of Melanie Dickerson’s books? Are you going to read this book? What do you think about retellings? I’ve never read any of her books, but I’ll have to read this one! It looks like an interesting retelling. It is interesting! It’s book 11 in the Hagenheim series, but all the books can be read as standalones just fine. Let me know what you think if you read it! If you were asking me, I haven’t; I need to see if I can find a good library or digital copy sometime in the future. Google’s good for finding local libraries! I like their maps app. Digital copy is an Ebook, right? Yup, Google is handy for a lot of things :DD Yes it is! Thank you! Yours was, too. I loved this review, Grace! Thank you! It was a lot of fun to write. Your book reviews make me wish I had more recreational reading time. Thanks for sharing. Thank you, that’s very kind. I enjoy writing them. Hey, Grace! I just wanted to let you know that you’ve been nominated for The Awesome Blogger Award. 🙂 https://clara-and-co.com/2019/01/10/random-post-14/ I hope you have a great day! Oh, thank you so much! I’m honored. 🙂 I’ll take a look! Is Melanie Dickerson rewriting several fairy tales? I’m also not sure of the story of Mulan exists outside of Disney. Do you know? She has an eleven-book series she calls the Hagenheim Series, and all the books are retellings of fairy tales set in medieval Europe. Some of the books aren’t amazing, but a good few of them (like this one) are actually fairly enjoyable, if a light read. Mulan is actually a fairy-tale outside of Disney. Disney adapted the Asian folktale “The Ballad of Hua Mulan.” The original ballad is supposedly based off a real woman’s adventures, but fictionalized over time and retelling. It’s one of my favorite fairy or folk tales. I’ve slowly been plugging through Melanie Dickerson’s Hagenheim series in order, but I’m super excited to read the latest couple! I’ve heard a lot of good things (and excitement) surrounding this book, so I’m very excited to read it! This one was my favorite in the series so far. Mulan was an amazing character. It can be fun to have the background from the rest of the series and recognize the characters from previous books when the come up, but I think Melanie Dickerson does a good job making sure her books can be read as stand-alones, too. Good to know!! I’m looking forward to it when I catch up! They are good as standalones! I’ve read a couple of them out of order, but I’m reading them in order so that I can get all of the background: I think that will be so fun! I'm Grace. I love books, writing, strange facts, art, and lists. On my blog, I’ll be posting book reviews, lists, and opinions. You're welcome to come along for the ride!